Dragon Fantasy: Book I was recently released on PSN to scratch your old-school RPG itch. I really like and appreciate the retro look, as you will likely know if you read some of my other reviews. The world map really reminds me of Final Fantasy (yes, the first one), but the battles feel more like Dragon Warrior. My favorite part of the overall look of the game is that you can switch it between an 8-bit and more of a 16-bit look. I really like options like that, and it's fun to switch between them. The monsters don't look much different, but the map and people do. As a nice bonus, the simplistic, retro music also changes! While I did like a lot of the visual and music/sound, there is one part that bugged me. When you are poisoned, the menu and text bubbles all become green. It's normally a nice blue (like Final Fantasy II/IV) or black (if you turn off "enhanced mode"), so this change is jarring to me. It also makes it harder to decipher what you are selecting, since the highlighted text also changes to a shade of green. I appreciate that there is a change when you are poisoned, but I'd like something a little more subtle. If you have multiple people in the party, it's not readily apparent who is poisoned until the game tells you they lose health. To make this kind of thing worse, when you are low on health, it changes to red. It's the visual version of the super annoying beeping when you are low on health in the Pokemon and Legend of Zelda games. I would like it better if you could turn it off or somehow lessen the effect. Also, the screen flashes red when you step on damaging terrain, which makes me wince a bit when I do it. As an old-school RPG, you can probably guess how the game plays. There are random encounters and you select your moves from a menu every turn. Since I like turn-based RPGs, I can't complain. Although, I feel like I miss a lot in combat. You can see your accuracy in the status screen, but it sure doesn't feel like the 80%+ that the game says I have. You can easily miss multiple times in a row, which has actually gotten me killed in the game. A note here: a few days after launch, there was a patch that recalculated the accuracy, effectively raising it just enough to make it fine, but I wanted to mention the pre-patch accuracy impressions too. Getting defeated in Dragon Fantasy isn't too bad. It's very much like Pokemon. You lose half of your money and go back to town. I will admit it is annoying to lose money, since I barely had enough until the very end of the chapters, when I didn't need it. I quickly slipped back into old habits and would spend time grinding whenever I hit a new town. Even then, it took a chunk of time to raise the money to afford all the upgraded equipment. Usually I would buy a few and make do. In some towns you can store money in a bank, but only in increments of 1000. Yes, lower increments would have been nicer, but I also understand that they need some penalty for getting killed. As a fan of parodies, I appreciate the humor in the game. Most enemies have names that are funny or references to things like Stealy Dan (he's a thief, get it? ), Audrey, and Obligatory Orc. They have funny attacks too, like when the Son of Rock Monster yells "You're not the boss of me!" Probably my favorite part is the text when you defeat the monsters. "Stealy Dan broke up" and when a werewolf becomes "a cold, scared, naked guy" are two funny examples. These little bits show lots of care for the little parts of the game, since even the pallet swaps of different monster have different attack names and text when they are defeated. There's even a few direct references to old RPGs thrown in for good measure. Heck, even the title is a cross between Dragon Warrior and Final Fantasy. The humor won't be for everyone, but I really like it. The game is an RPG, so you will get a lot of playtime out of Dragon Fantasy Book I. There are 3 different main stories to play and 1 additional "intermission" story. The first chapter is Ogden by himself, and hence the hardest chapter, and clocks in at around 8 hours. The second chapter is the easiest, since Anders can recruit a party, and is about 2-3 hours. The third chapter, about the thief Jerald, is about 3-4 hours. The bonus Intermission M is about 1-2 hours total. Fans of Minecraft should like the intermission, since you can finally have a creeper help you instead of just ruining your hard work. Total playtime is about 15 hours, which is pretty good for $10. The story is pretty good, too. I'm a fan of multiple perspectives, so I really like that the three stories intertwine and tell pieces of a larger whole. The Intermission is likely just a joke chapter and not part of the main story, though. If you are after trophies, they are pretty easy to get. Most of them are obtained by playing through the various chapters, with only a few being missable. Getting those will likely be the only reason you replay the game. While playing, I did encounter a few bugs. Mostly, they were game freezes and crashes. Originally, after playing for thirty minutes or so, the game would freeze. This was quickly patched out, but that patch causes a freeze toward the end of Chapter 3. You can reinstall the game and not install the patch to get past that. Also, there is a freeze after the credits for the Intermission chapter, but it does not affect getting the trophy. You will definitely want to update the game when you play, but be aware of these issues. Given how quickly the first patch was released, it is obvious that Muteki Corporation are working hard to fix the issues, and I appreciate that they clearly care about their product. As much as I like the game, I do have a few minor gripes. True to old school RPGs, you can only walk. A dash button would've been nice for those long stretches of walking. According to one of the developers, Adam Rippon (on GameFAQs of all places), the next patch will be adding a run button, so hopefully I can cross that gripe off the list. Other gripes include no world map, no inventory or spell sorting and the high encounter rate. The encounter rate is nice when you want to grind, but annoying when trying to make your way through a dungeon. These didn't keep me from enjoying the game, though. I was pleasantly surprised when playing Dragon Fantasy Book I. I love the retro look and gameplay, as it really takes me back to when I was a kid. 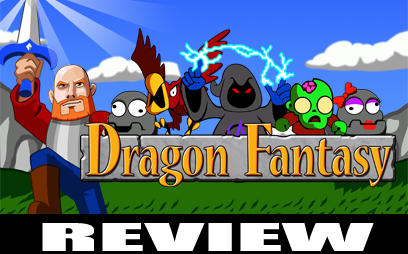 If you played RPGs in the late 80s and early 90s, I'd recommend trying Dragon Fantasy. I'm not sure how much younger gamers would get out of it, but my 6 year old is trying to play it after seeing me play it. It's fun and has me looking forward to Book II, which I'm hoping will make its way to the PS3! Bonus Tip: In Chapter 3, after recruiting Ramona, steal from the guard south of the Thieves Guild by "talking" to him from behind. You will get 100 gold but have to fight him. When you win, you get 100xp and another 25 gold. If you go into a nearby building, it will reset him so you can do it again. This was the most efficient way to get money (and xp) in Jerald's story. You will get the high end equipment in no time! I recently saw that Namco Bandai announced the special edition of Tales of Xillia is coming to the U.S., and I'm really hoping to get one (not as much as my wife is hoping we get one, though). It's $100, and comes with the game, art book, soundtrack and a statue of one of the main characters, Milla. At first, only Gamestop had preorders available, and they stopped taking them in the stores after a few days. Now Amazon has now added it, too. I'm sure they will run out soon. Also my second most anticipated 3DS game, Project X Zone, will have its own limited edition. I'm sure that will be the only edition, as I feel it won't be printed again. It has a "mini" art book, "mini" poster and soundtrack cd. I'm going to jump on both of these as soon as I can. I'm always a sucker for special editions. Back when I had the funds, I bought many of them. If you make it shiny, I was more likely to get it. Art books are always my favorite, especially if I like the art style of the game (and even more if it's anime style). Being an artist/designer (my degree), that makes sense. I have most of my promo artbooks on a bookshelf in my living room. Yes, I'm a huge nerd. On the other side, my wife really likes getting soundtracks. It has nothing to do with her major, but she likes listening to music, so another soundtrack is always welcome. You could see how most special editions were perfect for us. Now, it's not really feasible to get them. I'm going to do what I can to get that Xillia one, though. I'm also going to try for the Project X Zone one, although I'm convinced there won't be a non-limited version of the game here. I'm sure when I do, I will have reviews up for both of them. I'll also finally learn something about Milla and Jude from Xillia, instead of what little I could gleam from Tales of the Heroes. And speaking of reviews (yes I know I shouldn't start a sentence with the word 'and'), I'm working on a few now, so they should start appearing in the next few days. The base game of Metal Gear Rising: Revengeance was fun, sometimes hard. The new DLC, Jetstream, allows players to play as Sam, "the Brazilian Wind", in events leading up to the main game. This is a good way to flesh out another character while still keeping the story true to the base game. Story-wise, I am a fan of playing as the villain at some point, since it gives another perspective on the events of the game. Granted this is more prequel than another perspective, but it is still something that interests me. Just like the base game, the graphics are great. The controls are pretty spot-on. The difficulty still seems all over the place and the camera is still horrible. So what does the DLC do differently? Thankfully, Sam plays a little bit differently than Raiden. He cannot do the "ninja kills" (unfortunately), but can taunt and you can charge his strong (triangle/ Y button) attack for his unique "quick draw" skill. I like the attack, but I found it hard to use, since enemies don't like to give you time to charge it. If you could hold the attack until you let go of the button, I think it would be better to me, so I could charge it early. As it was, I would frequently get attacked while trying to use it. I also realized too late (just before the end boss of the level) that the charge attack was really effective on most of the enemies I struggled with. Taunting is supposed to make the enemies more aggressive, which is crazy since they are already pretty bloodthirsty. Sadly, I struggled a lot with some of the fights in the DLC level. At first it was working off the ring rust and remembering the timing of the parry. Once I was better at the timing, it seemed like the parry just wasn't as effective. Enemies tended to jump out of the way (or counter parry) more than I remember in the base game of Revengeance. Also some of the more damaging attacks will hit you when you are on the ground, leading to more damage and frustration. The enemies are pretty competent killing machines. As mentioned earlier, I found out near the end that the charge attack seems to be the cure to those woes, so I should have practiced that instead of parrying. Doh. That said, there were still fights that were incredibly hard (and of course the camera didn't want to cooperate). The sword and rpg wielding solders were ridiculous, but are a lot easier if you can land a quick draw on them. The big gorilla-like soldiers were a lot tougher than I remember them being in the base game, and the quick draw didn't seem particularly useful on them. The hardest fight by far is against Blade Wolf. I'm really confused as to why they put one of the most aggravating fights from the base game in again. This time it seems even harder, since I was only able to effectively parry one of its moves. The only strategy I found that worked for me was to spam the dodge (square + X) and attack quickly during the way too brief moments it stopped moving. This took a bit, I still needed the auto heals, and it hurt my hand. The other two bosses weren't nearly as bad. Sure, the final boss took 2 or 3 tries, but it still wasn't as bad as Blade Wolf. The Jetstream DLC is one long level. My total completion time was just over an hour and a half, but you may know that it doesn't add the time if you die and continue, so it actually took me almost three hours to complete. The trophies it adds will take a lot of effort, since there is a speed run on the hardest difficulty and beating the last boss without taking damage on hard. Yikes, not ones I am going to get. Thankfully there isn't one for doing the VR missions, since Sam's are accessed during the mission. I wish they were just unlocked and not "do them right here and now". I was pretty bad at them, since I only ran across combat-related ones. 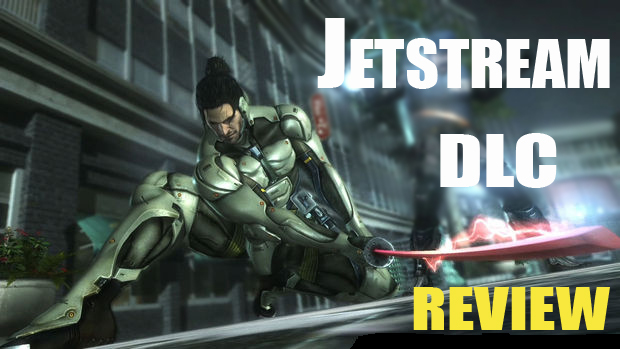 If you loved the base game of Metal Gear Rising: Revengeance, welcomed the challenges, and ran through multiple times on the harder difficulties, you will like the Jetstream DLC, and likely get your $10 worth. It offers enough familiarity (good and bad) but adds in some new mechanics to keep it fresh. If you are a beat it once and leave it kind of person, you may want to wait for a sale. Either way, it's a good addition to the game. The last week was pretty nice. The kids spent their spring break at my parent's house, so the wife and I had the whole house to ourselves. Nice, relaxing and quiet. What a fun week. Of course it went by way too fast, but thankfully I got some good gaming in (and other things). Last Saturday night, I went to a big dinner at Claim Jumper's that was for a group of people that used to work at Gamestop. It was pretty fun, as some of them I had not seen in years (and were surprised I had a second child). I didn't get to talk to a few people as much as I had hoped. I had time, since we had to wait way too long to actually get a table, despite having a reservation (probably because it was a party of 12+). There just wasn't enough space in the lobby area, since it was also during a busy time. Sadly, the service wasn't very good, but the food was. I tried to order something cheap, and ended up getting a personal pizza there. It was really good! I ducked out when one of my buddies was leaving, since I did want to see my wife at some point, ha ha. I also was able to play some mature rated games during the day, which I try not to when little eyes and ears are around (mostly for the swearing). I finally beat Prototype 2, and got most of the achievements. There will likely be a review of that in the near future. I played some more Gears of War 3 with my friends, and even started the RAAM's Shadow campaign (I don't want to actually play the campaign of Gears 3 until I finish 2). I got a review up for Phantom Breaker, grabbed a few achievements in Skylanders (since they are harder to get while playing with my son) and generally had fun playing some games without being interrupted every 5 minutes. 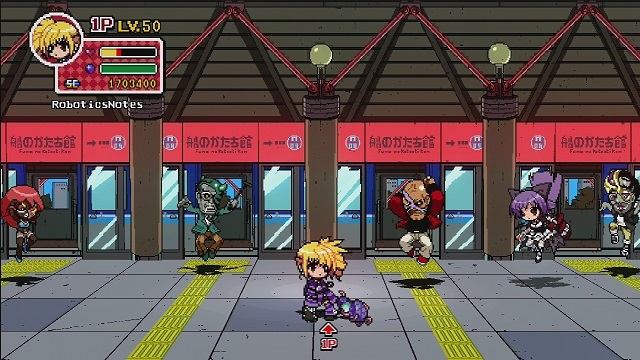 Recently, the spin off game Phantom Breaker: Battle Grounds was released on Xbox Live Arcade. When I first saw the look of the game, I knew I had to try it. You may know I'm a fan of retro graphics and sprites, and that's what this game has. The look harkens back to the Super Nintendo era, and I really like it. The models animate beautifully, so there are some nice modern amenities added to the retro designs. Battle Grounds is really fun to just look at. What if retro graphics aren't your thing? Is there good gameplay to make you want to play it? If you like playing side-scrolling action games or beat 'em ups like Final Fight, then the answer to that is a resounding "yes!" The game plays a lot like an old (and amazing) game called Guardian Heroes. You move around and attack enemies with 3 different standard attacks that can be chained together to make combos. Special moves can be purchased with points obtained at level ups to give you even more options to damage your opponents. One awesome aspect is that you can respec your character anytime you are on the skill screen. This makes it a lot easier to fight, since you can go for a skill that will help, or just beef up your stats. I really like using the special moves after different attacks to make up combos. Attack a few times, then use your uppercut move to get more hits and send the opponent flying. Launch the enemy into the sky at the end of the combo and hit them with a projectile as they are falling. These are the kind of things I love to do in these games. Luckily the fighting is fluid enough that I can do this. You get a little "super" meter under your health so you can use powered up "EX" moves for more damage. You also get a move that will slow down all the enemies so you can mercilessly pummel them. It doesn't seem as useful as it should be, and if you do it while the enemy is attacking, it can be harder to use it effectively. 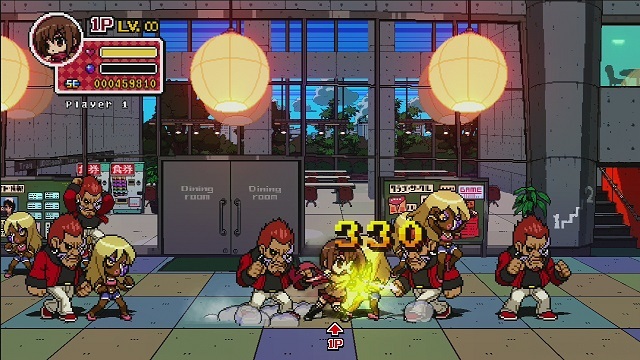 Really, the combat in Phantom Breaker: Battle Grounds is a lot like a fighting game. Given that it is a spin-off of a fighting game, this makes sense. There are only a few stages in the game, but they are fairly long. Factor in replaying stages to level up so the bosses are easier (if playing by yourself) and the length of each game is pretty good. It's very reminiscent of beat em up arcade games, so it's not going to be a 20 hour play, but that's good. You start with 4 different characters and others are earned from beating the game, so there is lots to do if you want to keep playing (which I definitely did want to do). Unlockable characters cannot be used in Story Mode, but that's fine since you get all the stages in Arcade Mode with none of the cut scenes. There's even a versus mode, if you really want to see how your fighting measures up to everyone else. The story of the game isn't amazing, but it gets the job done. There seems to be legit reasons why you go to each stage and fight each boss. There are a multitude of characters you run across and fight, but you don't get to know much about them. I get the feeling that people who played the original Phantom Breaker will know who these people are. The cut scenes are voiced, which was unexpected. The only thing I don't like about the cut scenes is that they cannot be skipped. So, when you die on a boss, you have to watch them banter before you try again. Yes, I said "when" you die on a boss. They are hard. Through normal progression, some of them will stop you cold. Starting out on the normal setting, I beat the first two bosses without dying, but the third, Cocoa, destroyed me. She's a little claw-wielding maniac hyped up on pixiesticks. The bosses attack relentlessly and are strong enough to really hurt your health bar. I eventually leveled up enough to get past her... until she showed up again. Unfortunately, you fight Cocoa several times, and even on the easy setting, she is a berserker trying to tear your face off. Besides the bosses, there are several fights that can get difficult, mostly from a large group of enemies (or large enemies) that just barrage you. The "emergency escape" maneuver can save you, but those parts can still be tricky. If you are like me, you will see this a few times. The best option to get through the tricky parts is by bringing a friend, or finding a partner on Xbox Live. Just like Final Fight and Guardian Heroes, this game is even more fun when played with others. While I've only joined one online game so far, there was no lag. I really like that each character keeps their own screen, so all your running around won't constrain the other characters to the same visual area. It was also easy to resurrect the other person when they did die (although I died much more than they did). It was lots of fun, and I'm definitely recruiting my wife to play some too. She loves playing games with me, so I'm sure she'll like this, too. If you like achievements, the list for Battle Grounds isn't too bad. Most are obtained from playing the game, although there are a few that will require luck and skill. There are some bonus stages that may take a few tries to get the associated achievement, but it's far from impossible. Beating hard mode will likely be the hardest for me personally, so I'll probably get some friends to do that with. I like the character designs. I really like the look of the game. I love the gameplay. Honestly, this is one of my favorite XBLA games that I've played. It's just fun, and with several characters to use, I have many reasons to play. I had enough fun that getting destroyed by over-caffeinated Cocoa didn't deter me from trying until I got past her. I'm even looking forward to getting the DLC eventually, so I can try the new character. If you are a big fan of Final Fight and Guardian Heroes, go try this game, it's a lot of fun!